Marlin, Sailfish and Yellowfin Tuna at Corbeteña and El Banco! Marlin, Sailfish, Yellowfin Tuna, Dorado, as the mercury climbs the thermometer we definitely know we are moving into summer. Water Temperatures are still in the perfect range, the water is blue, plenty of bait, and those with the fuel money are coming in every day with fish! Just in time for the 5th annual International Marlin and Tuna Tournament of Banderas Bay and Riviera Nayarit! This starts this weekend on the 15th with the registration party and then Saturday and Sunday the tournament begins. Those of you involved, good luck, you have some fish to make it worth entering this year! We have been waiting for Dorado to show up in some decent numbers since May and finally we are looking at these gold and blue beauties picking up in numbers in places like Sayulita, Marietta Islands, off Punta Mita and even Yelapa in the bay. Now these are not huge, but they´re running in the 15 to 25lb range which is perfect for the freezer. I had to get that in first since I have been wanting to tell people there were Dorado out there but couldn`t suggest targeting them until now… so there you go, happy Dorado hunting! Like I mentioned earlier, Black Marlin are still at Corbeteña and El Banco. Now things can be hot or cold, it just depends on the day. There were a few days this past week where we were scratching our heads. The Yellowfin in these two deep water locations are a little fickle right now. They are taking bait, but you´ll have to be on your game and be patient for them to strike. 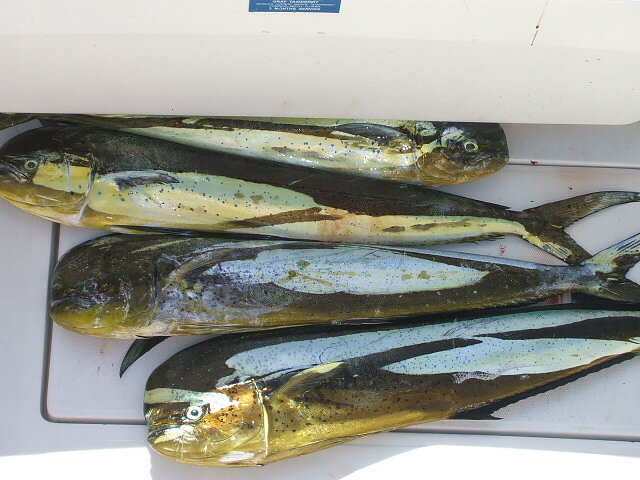 The bite has been happening now about 11:00 a.m. so getting out to the fishing grounds too early will not do you any good. For those planning closer in trips this is important information so you can make sure you hit the best time to be on the water and now waste valuable fishing time or fuel dollars trolling around waiting for the bite. Keep this in mind if heading out fishing. Both Corbeteña and El Banco are seeing the numbers of Black Marlin increase by the day. They are not so abundant you can count on catching one, but there are enough out there to give you a heck of a shot at one. They have been ranging between 400 to 550 lbs for now. Now that sounds like a huge fish, it is big by any measurement, but we´re still on the small side as these babies can reach the 1,000 lb range in late August to early November. So keep this in mind as you get strikes. July 13 Update: El Banco the last two days has produced some Yellowfin Tuna over 125lbs! They are fickle as well, Poppers, cedar plugs, lures, live bait, you name it. But the one thing that has been helping is a kite… That´s right folks the kites are working again so if you don´t have one or are on a well equipped boat with a kite, then you will probably still catch fish, but then again….. remember the boat with the correct equipment and tackle is what you are paying for, give yourself the best chance to catch fish, but make sure you spend the money and get a well equipped boat. Blue Marlin are also here along with the Black Marlin … they are both running in the 500lb range, nothing changing there…. Sailfish are finally picking up in numbers and Corbeteña the last few days have been alive with Sailfish action. You can expect plenty of Sailfish action at Corbeteña but that will be a ten hour day. Worth the distance and the fuel dollar if you shake enough change from the couch cushions! Sailfish are having no problems going after bait and the bait at both the Rock and El Banco are very large Skippies or Skip Jack Tuna in the football size which is perfect size for bait, for larger fish that is. The bay has been hot one day, cold the next. The football sized Yellowfin Tuna have been moving around and some days you can find them, but getting them to take bait can be frustrating for sure. Again, keep your patience, they will take the bait eventually. Now if you are around Yelapa there have been some smaller Dorado, but Dorado none the less. With Sierra Mackerals, Bonito, Needle Fish and the list goes on, the bay is well worth your time and fuel dollar. Even a four hour day will be productive and fun! So there are plenty of reasons to head out on the bay fishing and things are just getting better amigos! Tourism for Puerto Vallarta is as bad AS I CAN REMEMBER. There are very few boats heading out in the morning and it is very difficult to get a feel for what is happening when very few boats are heading out of the bay. The clientele is just not here in Puerto Vallarta and I don´t see this condition improving until November. This means the summer season in Puerto Vallarta can be yours with cheap airfares after August and incredible fishing from Now until New Years. If you are planning on heading down to Puerto Vallarta and have any questions on fishing, local tournaments, or are just looking for a boat at the best price available, then let me know and we`ll get you on the right boat, for the right prices. For recent news. My blog will have the latest during the week so you can get the latest info there: www.masterbaiters.wordpress.com sign up for notifications of new articles……. So for now the fishing at Corbeteña and El Banco is worth the time and fuel. The bay is still alive with action for those on a budget or plain don`t want to spend too many hours on a boat. Punta Mita is picking up and is a great place to find Dorado with Sayulita boiling with them as well…. 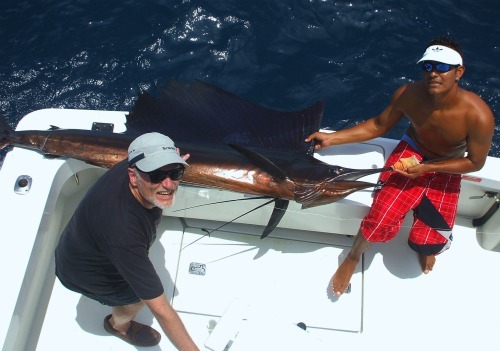 You ,may also find a Rooster fish looking for your bait as well, they´re in the area! Marietta Islands are still alive, but the point at Cabo Corrientes is still getting captains attention. As a summary the fishing is getting better by the day, the conditions are perfect and the fishing grounds are fairly empty. The world is yours in Puerto Vallarta, all you have to do is show up! As the oldest fishing company in Puerto Vallarta and the only company with any World Recognized Fishing Championships like the WBS Billfishing Series Grand Champions (2000 and 2001) under our belt. Nobody, but nobody in Puerto Vallarta can come close to us in quality or price when it comes to world class fishing boats. We work for your business which explains why seventy percent of my business at Master Baiter´s is return business! You work hard for your precious vacation, money is hard enough to come by, you don´t need to worry about the companies you are dealing with! 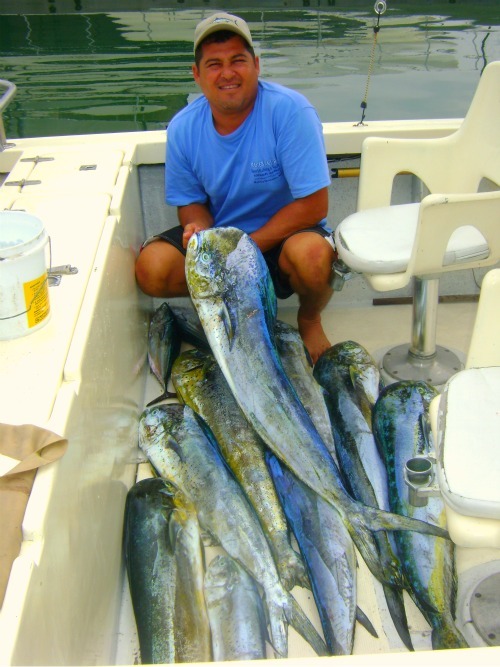 Remember, at Master Baiter´s Sportfishing and Tackle, We Won´t Jerk You Around! If you have any questions on any subject regarding fishing or Puerto Vallarta, feel free to ask! This entry was posted in Beach Vacations, Big Game Fishing, Deep Sea Fishing, Family Vacations, Fishing, Fishing Articles, Fishing for Sailfish Fishing, Fishing in Mexico, Fishing in Puerto Vallarta, Florida Sportfishing, Gulf of Mexico Oil Spill, Marina Vallarta, Marlin fishing, Marlin Fishing in Hawaii, Marlin Fishing PV, Mexico, Mexico fishing, Mexico Pirates, Mexico Safety, Mexico Safety Concerns, Mexico Tourism, Pictures Fish, Porto Vayarta, Porto Viarta, Puerta Vallarta, puerta viarta, Puerto Vallarta, Puerto Vallarta Sportfishing, Puerto Vallarta tourism guide, Puerto Vallartra Fishing, Puerto Viarta, Restaurants in Puerto Vallarta, Safe Travel in Mexico, Sport fishing, Sportfishing in Puerto Vallarta, Sportfishing Puerto Vallarta, Sports Travel, Travel, Travel Sports, Uncategorized, Yacht Rental, Yellowfin Tuna Fishing and tagged Big Game Fishing, Bloody Decks Puerto Vallarta, Cabo Sportfishing, charters, Deep Sea Fishing, Fishing, Fishing Tours in Puerto Vallarta, Marlin, Marlin fishing, Mexico, Puerta Viarta, Puerto Vallarta, Puerto Vallarta Bloody Decks, Puerto Vallarta Fishing Reports, Puerto Vallarta Tours, Sailfish, Sportfishing, Sportfishing in Cabo San Lucas, Tours in Puerto Vallarta, Travel, Tuna fishing, Yellowfin tuna, Yellowfin Tuna Fishing. Bookmark the permalink. Dorado Pick Up, Yellowfin Tuna Footballs Everywhere, Corbetena Comes to Life! Dorado in Yelapa, Tuna at Corbeteña and El Banco, Seasonal Rains Begin!